Chia pudding made with almond milk is delicious, and when you top if off with a simple strawberry sauce, it's even better. You can make it the night before and leave it in the fridge for your breakfast, or make it in advance for an indulgent dessert later on in the day. Combine all the ingredients except the strawberries and agave evenly in the bowls or jars you wish to serve the chia pudding in. Stir well and then chill the mixture for an hour in the fridge. Take the chia mixture out the fridge and stir again. Now let them set in the fridge for at least four hours, or better still, overnight. Cut the strawberries into quarters and rinse them under cold water. Place them in a saucepan and cook on medium heat. After 10 minutes you will be left with a lovely, chunky sauce. Add a little agave syrup, as a sweetener if you like. Taste, and if you would prefer it to be sweeter, add more agave. Boil for another 5 minutes and then allow the sauce to cool. 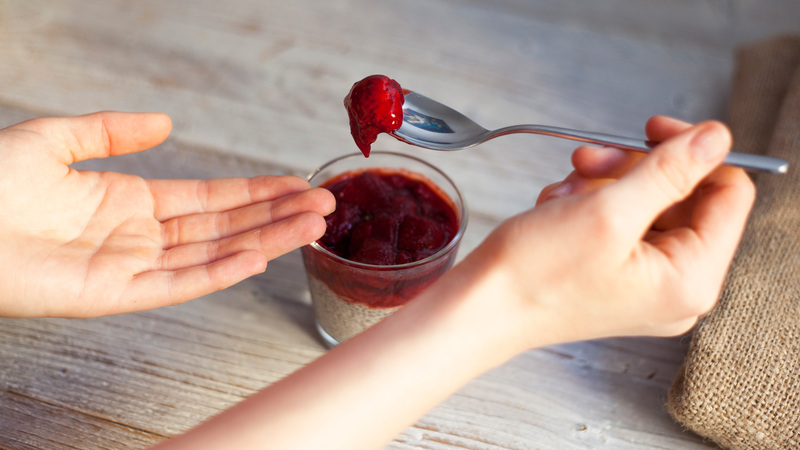 Serve the chia pudding with the strawberry sauce on top – delicious!